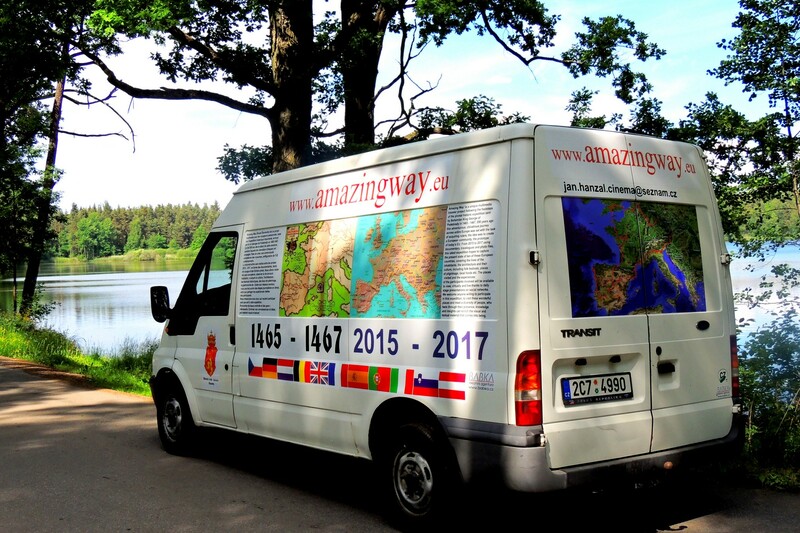 Amazing Way' is a unique multimedia traveler project following the footsteps of the pivotal historic expedition sent by Bohemian King George of Podebrady in 1465 – 1467.
let me share with you some thoughts and information about AMAZING WAY – „The Dark Star Quest“, a project, which offers a lot of ways to participate in original and interesting expedition following an important quest of the past. Anyone can contribute to the quest, helping with his/her knowledge and experience or providing texts, films and photographs for the project website. And of course, when the time comes, anyone is also welcome to take part in the quest itself. Apart from other goals of the project, we will try to show all videos and photographs from the expedition in care centres, thus making them available to those who are too old or ill to travel to these places, no matter how much they would like to do so. The world is intersected by a net of magnetic lines of force and negative as well as positive zones. Most of sacral buildings, chapels, wayside shrines, sacred and healing places are located in zones with positive emanation, where the energy can be deeply felt, giving us an inexpressible experience. This impact is caused by specific constellation, which gives rise to the positive energy. Thanks to these vibes combined with brilliance of human spirit and masterly hands of builders, artists and craftsmen, it was possible to create monumental masterpieces, which act as acupuncture points on the Earth’s meridians, at the same time being capable of lifting human soul to more subtle planes. Such vibes can be also observed in some musical compositions and other works of art, being initially imprinted by the authors and later on multiplied by attention and compassionate understanding of the audience. It is a well-known and proven fact that this emanation refines human beings and harmonizes certain levels of human core. Unfortunately, our civilization is increasingly heading in a shallow and material direction, with people becoming deaf and blind to the increasingly urgent warnings of our violated nature, and aggression and omnipresent violence in media for adults as well as in computer games for children lowering our sensitivity threshold, resulting in the loss of sense of belonging and the need to help the less fortunate. Such consequences arise from a moral decline of the society, whose leaders are characterized above all by their negative traits and egoisms, often favouring various interest groups, and thus influencing public opinion. And as they get more than their fair share of space in the media, their deplorable behaviour is slowly becoming a norm. I know a lot of people who – for some inexplicable reason – believe that whatever injustice occurs in this increasingly rough and technologically developed virtual media reality, it doesn’t concern them. They are as safe as ever… Until, inevitably, it does happen to them. And it is only then, in the moment of crisis and tragedy which they experience at first hand that they are suddenly capable to hug a stranger, to help without seeking any kind of benefit to themselves, or to stop discriminating people based on their social standing. This is a good news: a yet-to-be-explained miracle which created an intelligent, social human being capable of thinking and perceiving even the most subliminal of energy flows, including the primal core of society, is still with us. Considering recent events, showing clearly and increasingly negative impact of global climate change as well as social, religious and ethnic unrest, our planet and we, its inhabitants, are facing a point of no return. And in this time and space, it is the duty to everybody who believes to be a part of higher principle to get involved as much as possible. Because each reaction provokes an action, it follows that this positive involvement rises proportionately with the rise of negativity, with people seeking an alternative life style respectful to the laws of nature, or faith encompassing some kind of higher justice comprehensible to them; or who on the contrary turn back to classical values, visiting islands of peace and quiet in the form of historical monuments, period performances, folk celebrations, funfairs, sacred places of pilgrimage, meditation centres etc. While doing so, they are able to recharge their batteries with positive energy, to see different lands, to get to know mentality of local people and to connect all this to their own inner beings, thus discovering more about themselves and learning to prioritize in their future life. And thanks to those thousands of pilgrims, visitors and seekers, the paths leading to such soul refreshing oases are becoming more than just another means of communication. Many will find that the journey itself can become a meaningful destination, giving them a new purpose in life. Of course, there are endless possibilities, and our project is no more than one of them. „The Dark Star Quest“ resulted from past and current notions, life experience and thoughts about life of the author as well as of all those he has met so far. When we forget what it was we were looking for, we go back to the place, where we started searching, and finding the imprint of our original thought, we are almost always able to remember what we wanted, and why. We can encounter something similar when visiting certain places, concerts, or when seeing certain paintings and sculptures which embody faith in the power of beauty, love, wisdom and harmony, thus triggering strong, pleasant and emotional experience. The well-trodden paths are imprinted not only with the steps of pilgrims but also with the essence of their dreams, hopes and fates, which they carried with them to their destination. That might be a reason behind the current surge of pilgrimages to such places as Santiago de Compostela, Mariazell, Montserrat, Stonehenge etc. According to our abilities and courage to facilitate changes, we can set on a journey along one of these paths, experience something new, meet new friends, and enrich our lives as well as the lives of others. It is said that if you want to change the world, you have to start with yourself. And that is true as much today as ever. All people across the world live their lives according to their abilities and possibilities they were given. Apart from the dishonest and corrupt, people in general devote their lives to their work, families, studies, interests, etc., all the while getting ready for the time, when – for various reasons usually connected to old age – they’ll be forced to significantly change their everyday rhythm. In old age, people often have to leave their jobs, no matter how experienced they might be, either because they lack sufficient energy or because they are simply made to leave. Sometimes, they stop participating even in other social activities. The few lucky ones continue to use their skills and knowledge, but the most of them box them inside with the last salary, which is a great pity for everybody. Eastern philosophies talk about akasha, a cosmic conscience of the sort, where all thoughts and events come to rest; but this treasury benefits only spiritually and morally enlightened followers of these philosophies, the few chosen ones. Our culture is rooted in materialism and based on verbal expression, therefore if we want to save something, we have to use the media. Luckily, this rather mechanical transfer of information and its emotional charge doesn’t preclude the first law of thermodynamics, this time conserving the positive energy. Deep down, everybody hopes that one day will have enough time for himself/herself to make his/her dream come true, and this hope is usually pinned to the above mentioned stage in life. Unfortunately, there are a lot of those, who won’t be able to do so, either because of failing health, or social constraints. „The Dark Star Quest “ is an opportunity for everybody who is willing to participate in it , be it actively or passively, to share with others his/her life experience, expert knowledge, personal observations and opinions on an endless number of topics and issues, thus tipping the scales of the current world towards the positive, and to help the less fortunate to be virtually present in the quest for knowledge of all what is inspiring and beautiful, of all what has been and will be created to balance violence and destruction. This entry was posted in Amazing Way by admin. Bookmark the permalink. Entony: Hellou visitors, welcome to Amazing Way. Copyright © 2019 AMAZING WAY All Rights Reserved.